2019 prize lists for all 7 Red Tail competitions are now posted on our website! Please reach out to the competition manager, Erika Olijslager, with any questions or concerns (rtfdressage@gmail.com). Congratulations to our Red Tail riders and horses on all of their hard work! Following a few years of only 1 Red Tail horse/rider competing at the US Dressage Finals, in 2018 we had 5 horses make the trek to The Kentucky Horse Park! It was an incredible week of riding, laughs, freezing fingers, bourbon, and victory gallops that we will never forget! Congratulations to Rachel & Stetson, Meredith & Chilli, Jennifer & Hhemlock, Jillian & Hudson, and Erika & Archie! Red Tail staying warm in their winter coats at the warm up ring! Thank you to everyone who helped us get to KY! We could not have done it without our dedicated trainers, staff, drivers, and show competition staff & volunteers! Archibald RTF (aka Archie) finished in the top 10 for all three championship classes at Region 8 Championships with AA in Training Level, First Level, and First Level MFS. Qualified for US Dressage Nationals. Congratulations to all of our Red Tail riders on a very successful 2017! Red Tail Farm at Regional 8 Championships! Laura Ferrante and Karin Quayle also qualified for Regionals and did not compete, but they both drove up to support everyone! Call for Volunteers and Schooling Show Judge Announced! The judge for the 2017 ESDCTA recognized schooling show will be Karin Worm. The RTF schooling show welcomes riders of all levels, ages, and disciplines! Dressage tests of all levels, combined tests, and clear rounds are offered. The prizelist will be posted to our website shortly, be sure to get your entries in early! Planning for all (7!) 2017 Red Tail Farm shows is underway and we are looking for wonderful volunteers to help us put it all together! Our shows would not run smoothly without the hard work of our volunteers. If you are interested in volunteering please contact Meredith Whaley at mcwhaley@gmail.com with the days or hours you are available and preferred volunteer job included. Remember that these hours are ESDCTA eligible and can be used towards yours or a friend's year end awards! Prizelists will be released online shortly! Red Tail Farm is happy to announce the date for their Spring schooling and combined test show! Due to incredible interest, we are forced to close the Dressage at Red Tail Farm July I and II entries early! A wait list has been started and we will do our best to try to accommodate everyone. Thank you for your continued support and interest! This show is going to be our largest show to date! The prizelists for August I and II will be posted soon! Additional judges will be added as needed and prizelists will be available shortly! Please note that our Dr. Jenny Susser Clinic has been cancelled for April 2 & 3, 2016. We are looking forward to another successful show season and we hope to see you all again on the centerline! Mane Stream's Triple Threat Clinic is less than a week away! For all those who are interested in attending or auditing, please note that the clinic with Sinead Halpin has been rescheduled for a future date due to schedule conflicts. The clinics with Michael Baritone and Sandy Ferrell will take place as scheduled! Looking forward to a great weekend! Come and Spend the Winter at Red Tail! Looking for a great facility to spend the winter at? Red Tail Farm has a limited number of stalls available staring November 1st! Don't brave the cold, our state of the art facility, with an attached indoor with Arenaworks footing, is perfect for working on your Dressage basics with our guest trainer Heather Mason or your jumping skills with our new Hunter/Jumper guess trainer Michelle Guglielmo. After a great ride, spend some time warming up in our heated lounge, complete with full kitchen, all while making new friends! RTF Cleans up at the USDF Region 8 Championships! Congratulations to Team Red Tail on their fantastic performances at the New England Dressage Associations Fall Festival! 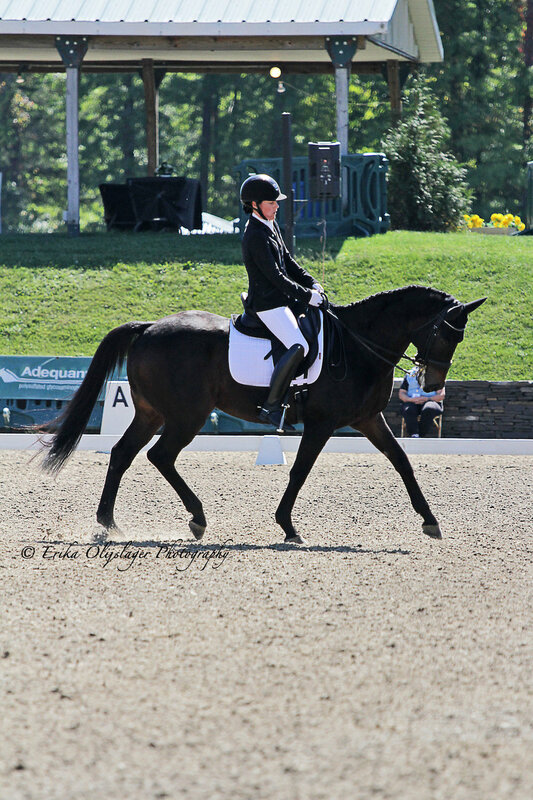 The New England Dressage Association Fall Festival hosted the USDF Region 8 Championships in picturesque Saugerties, New York from September 17th-20th. None of our competitors had even been to the regional championships before, heck! most of them only just began showing dressage this summer! In true Red Tail fashion, they were absolutely amazing competitors and gracious winners. Linda H. had two mounts in the show. On Lacey, she placed 5th in the Training 3 Open Class with a score of 67.7% and 2nd among Adult Amateurs. On Juliet, she placed 2nd among Adult Amateurs in the Level 1 Test 2 Open Class! Rachel and her mount Bailey placed 6th among Adult Amateurs in the Level 1 Test 2 Open Class and came in 14th among a field of 45 competitors in the Level 1 Test 3 Championship Class! Veronica and Smokey placed 6th in the Level 1 Test 3 Open Class, 6th in the Level 1 Test 2 Open Class, and 5th in the Level 1 Test 3 Adult Amateur Championship class with a score of 67%! Gwen and Callie placed 1st in the Training Level Test 1 Open Class with a score of 71%! Our competitors cannot thank their trainers, Meredith Whaley and Heather Mason for all that they have taught and done for them! They could never have done this without their dedication and expertise. RTF's owner Linda Dietz commented, " I was literally puffed up with pride...or maybe it was the Mexican food...no definitely it was pride!" Be sure to stop by the lounge and see all the beautiful and impressive ribbons on display! Dressage at RTF August I & II Results Posted Online! We feel that the old adage "Better late than never" is quite fitting for this blog post! Red Tail Farm had quite the busy summer and posting the results from out last show took the back burner to spending the last days of summer outside with our horses instead of sitting at a computer! The results from the last show of our inaugural series have been posted. Thank you to all of our friends who competed with us and to all of our new friends that we made this summer. We enjoyed having each and everyone of you apart of our great first series! Be sure to check back often for information regarding next years series! Registration Forms for Triple Threat Clinic Now Available! Registration forms are now available for the Triple Threat Clinic! Now is your chance to sign up up for sessions with three elite professionals in their respective fields. Be sure to sign up quick, spots are sure to go fast! Registered auditors are welcome too! Don't miss out on this great opportunity to learn from some top professionals while benefiting a great organization! Sinead Halpin to Make Two Stops at Red Tail this Fall! If you aren't available that weekend, Sinead will be back on Friday, November 6th as part of Mane Stream's Triple Threat Clinic. Registration forms are now available for all three clinicians. Be sure to sign up quick and help us help out a great organization! For more information, please contact Jen Dermody at jen@manestreamnj.org. International 3-Day Eventing star Sinead Halpin will be at Red Tail two times this fall! Her first stop will be on Saturday, September 12th as a guest trainer. Lesson slots are open throughout the day, but sign up early! These spots will go quick! For more information, please contact Meredith at mcwhaley@gmail.com. Auditor Spots Still Available for this Weekend! Dr. Jenny Susser will be returning to Red Tail this weekend on both Saturday 8.22 and Sunday 8.23 for her presentation on "Riding with Confidence". There are still auditor spots open for both days. Dr. Jenny Susser tailors her presentation to all in attendance; there is a wealth of information to learn! Make sure you don't miss out! To sign up or for more information, contact Meredith Whaley at mcwhaley@gmail.com.